The Cuban thaw (Spanish: deshielo cubano) was a warming of Cuba–United States relations that began in December 2014 ending a 54-year stretch of hostility between the nations. In March 2016, Barack Obama became the first U.S. President to visit Cuba since 1928. President Obama meets with President Castro in Panama. On December 17, 2014, U.S. President Barack Obama and Cuban President Raúl Castro announced the beginning of a process of normalizing relations between Cuba and the United States. The normalization agreement was secretly negotiated in preceding months, facilitated by Pope Francis and largely hosted by the Government of Canada. Meetings were held in both Canada and Vatican City. The agreement would see the lifting of some U.S. travel restrictions, fewer restrictions on remittances, U.S. banks' access to the Cuban financial system, and the reopening of the U.S. embassy in Havana and the Cuban embassy in Washington, which both closed in 1961 after the breakup of diplomatic relations as a result of Cuba's close alliance with the USSR. On April 14, 2015, the Obama administration announced that Cuba would be removed from the United States State Sponsors of Terrorism list. With no congressional action to block this within the permitted time period, Cuba was officially removed from the list on May 29, 2015. This marked a further departure by the United States from the Cold War conflict and its strain on Cuba–United States relations. On July 20, 2015, the Cuban and U.S. "interests sections" in Washington and Havana were upgraded to embassies. On June 16, 2017, President Donald Trump announced that he was "cancelling" the Obama administration's deals with Cuba, while also expressing that a new deal could be negotiated between the Cuban and United States governments. On November 8, 2017, it was announced business and travel restrictions which were loosened by the Obama administration would resume and would go into effect on November 9. In February 2015, Conan O'Brien became the third American television personality to film in Cuba in more than half a century (the first being Michael Moore's Sicko in 2007 and the second being Anthony Bourdain's No Reservations in 2011). In May 2015, the Minnesota Orchestra performed several concerts in Havana, the first professional U.S. orchestra to play in Cuba since 1999. Major League Baseball (MLB) held talks about playing spring training games in Cuba in 2015, but lacked time to arrange them. 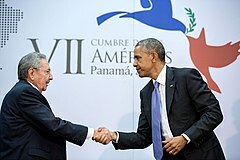 MLB Commissioner Rob Manfred said on March 19, 2015, that the league would likely play an exhibition game in Cuba sometime in early 2016  and on March 22, 2016, the Tampa Bay Rays played an exhibition game against the Cuban national team at Estadio Latinoamericano in Havana with Presidents Obama and Castro in attendance. On January 21, 2015, the United States and Cuba began bilateral talks in Havana to discuss further normalization issues. The U.S. delegation led by U.S. Assistant Secretary of State Roberta S. Jacobson, and Josefina Vidal Ferreiro, Cuba's head of North American affairs, sat down for the first day of closed-door talks in the capital's Convention Center. The talks reportedly centered around migration policy. In particular, Cuban representatives urged the U.S. to end its immigration privileges to Cuban refugees, also known as the wet feet, dry feet policy,[needs update] which allows any fleeing Cuban citizens U.S. residency and citizenship, as long as they are found on U.S. soil and not at sea. Reuters reported that civilian uncertainty about the status of U.S. immigration policy following the thaw was promoting a surge of emigrants fleeing Cuba for the U.S.
On April 14, 2015, President Obama informed the U.S. Congress that he had decided to lift the designation of Cuba as a state sponsor of terrorism because "the government of Cuba has not provided any support for international terrorism during the preceding six-month period", and it "has provided assurances that it will not support acts of international terrorism in the future". The U.S. Congress could have blocked this by passing legislation within 45 days, but no member of Congress even introduced such legislation, and Cuba was officially removed from the list on May 29, 2015. The Flag of Cuba is raised during the official reopening of the Embassy of Cuba in Washington, D.C. on 20 July 2015. The United States government has stated specific goals in improving trade with Cuba. Roberta Jacobson, an American diplomat, suggested bolstering Internet access and mobile phone service in Cuba to help its integration into the world economy. This has provided American telecommunication companies including Verizon and Sprint with a new market in Cuba. By July 20, 2016, US companies Airbnb and Netflix were operating in Cuba as well. The United States seeks to increase revenue from tourism in Cuba by lifting traveling restrictions which can be used for purchase of American agricultural and manufacturing exports to Cuba. On March 20, 2016, Starwood Hotels & Resorts Worldwide became the first US company to sign a deal with Cuba since the 1959 revolution and agreed to manage two Havana hotels which had formerly been owned by the Cuban government. The first of these hotels opened three months later on June 27. A number of American companies support further economic ties with Cuba, as do advocacy groups like Engage Cuba. On July 7, 2016, it was announced that eight US airline companies had been given tentative approval to fly to airports in Cuba and that flights, which would be limited to educational trips, would begin as early as September. On August 31, 2016, JetBlue became the first US commercial airline in more than 50 years to land a plane carrying US passengers at a Cuban airport when Flight 387 took off from Fort Lauderdale, Florida and landed in Santa Clara, Cuba. More flights have since followed, and two planes from JetBlue and American Airlines also made history by landing in the capital city of Havana on November 28, 2016, marking the first time in more than 50 years that a US commercial flight landed in Havana. By November 2017, however, numerous airline companies had quit doing flights to Cuba. Obama was the first sitting U.S. president to visit Cuba since Calvin Coolidge in 1928. Obama said that he would only visit Cuba if he could meet with Cuban dissidents: "If I go on a visit, then part of the deal is that I get to talk to everybody. I've made it very clear in my conversations directly with President Raúl Castro that we would continue to reach out to those who want to broaden the scope for, you know, free expression inside of Cuba." Raúl Castro, the Cuban president since 2008 and one of the leaders of the Cuban Revolution of the 1950s, declared in 2013 that "a slow and orderly transfer of the leadership of the revolution to the new generations" was already in progress. Castro pledged not to seek reelection in 2018. In announcing the agreement in December 2014, Castro struck a balance between praising the Marxist revolution that brought him and his brother Fidel to power almost 60 years prior and extolling the benefits that would be brought about by improved relations with the United States, namely the end of the Cuban embargo. The Cuban thaw has received a mixed reception among politicians in the United States. Prominent critics include Senator Marco Rubio of Florida. Rubio, a Cuban-American Republican, said that "diplomatic recognition [would] provide legitimacy to a government that doesn't deserve it." The 2014 congressional elections were a month prior to the announcement of the thaw. Like Senator Flake, Senator Rand Paul, a Republican from Kentucky, supports the thaw on the grounds that increased trade relations will benefit both Cubans and Americans. Senator Paul, in response to Senator Rubio, argued that "Senator Rubio is acting like an isolationist", and that, "The 50-year embargo just hasn't worked. If the goal is regime change, it sure doesn't seem to be working." Similarly, Obama's former Secretary of State and 2016 presidential candidate Hillary Clinton strongly endorsed the decision. Clinton has argued that the embargo "had propped up the Castro government because they could blame all of the country's problems on the United States. Moreover, the embargo did not have any impact on freedom of speech, freedom of expression, or on freeing political prisoners." Several Latin American leaders publicly welcomed the thaw, with Venezuelan President Nicolás Maduro hailing Obama's move toward normalization as a "valiant and historically necessary gesture", despite being a regular critic of U.S. policy. Colombian Liberal ex-President Ernesto Samper in his capacity as President of UNASUR said that "this was very good news, not only for Cuba but for the entire region". Juan Carlos Varela, the conservative President of Panama, said that in the 7th Summit of the Americas to be held in his country after April 7, 2015, it will be possible to "achieve the dream of a united region". The New Republic deemed the Cuban thaw to be "Obama's finest foreign policy achievement." The Indonesian journal Strategic Review proposed that Obama could follow the model of normalization of relations which his predecessor Bill Clinton had done with Vietnam-USA relationship. Granma, Cuba's state newspaper, published numerous articles regarding the Cuban thaw. It stated that "International public opinion supports removal of Cuba from U.S. list of state sponsors of terrorism," and that "[t]he decision is recognized as an important step in advancing President Obama's policy change to improve relations between the two countries." Additionally, they stated that "[t]he Cuban government recognizes the just decision taken by the President of the United States to eliminate Cuba from a list on which it never should have been included" and reiterated that Cuba "rejects and condemns all acts of terrorism in all their forms and manifestations, as well as any action that is intended to instigate, support, finance or conceal terrorist acts." A survey conducted by Pew Research Center in January 2016 found that 63% of Americans approved of Obama's decision to re-establish diplomatic relations with Cuba, while 28% disapproved. The study found that Democrats (74%) and Independents (67%) were more likely to support the re-established relations; 40% of Republicans approved. The study also found that 66% of Americans supported ending the trade embargo against Cuba, while 28% disapproved. Support for both the re-establishment of relations and the lifting of the trade embargo was seen broadly amongst all racial and ethnic groups (62% of whites, 64% of blacks, and 65% of Hispanics) and amongst all age-brackets, however younger Americans were more likely to support it than older Americans. Americans who were college or university graduates (77%) overwhelmingly supported the restoration of relations, while people with only some college education (59%) or only high school education (53%) were less likely to support it. Despite broad support for the re-establishment of diplomatic relations and the end of the trade embargo, only 32% of Americans surveyed believed that Cuba would become "more democratic" over the next several years, with 60% believing the situation in Cuba will remain the same. On June 16, 2017, President Donald Trump issued a presidential memorandum reversing some aspects of the Obama administration's actions regarding U.S. relations with Cuba, and characterizing them as "terrible and misguided". He expanded the prohibition on American money going to the Cuban military, saying it also prohibits dealings with the Grupo de Administracion Empresarial, a conglomerate which the Cuban military manages. That will have the effect of placing certain hotels and other tourism facilities off-limits to Americans. He reinstated a ban on individual travel to Cuba by Americans, while leaving in place travel permission for organized "educational" groups and family visits. Airline and cruise ship visits to Cuba will continue to be permitted. Diplomatic relations will remain in place and the embassies will remain open. The new restrictions will go into effect only after appropriate regulations are drawn up by the Treasury and Commerce departments. On November 8, 2017, it was announced that the business and travel restrictions which were loosened under the Obama administration would once again be tightened to include limits, ensuring that American tourists will once again have to go through tour operators in order to stay at a hotel or do business in Cuba starting November 9, 2017. ^ a b "Betting on a Cuban Thaw: Stocks Soar on Rumors of U.S. Relations With Cuba". Newsweek. Reuters. December 17, 2014. ^ a b Parker, K. Quincy (January 8, 2015). "CARICOM Launches Five-Year Plan". The Nassau Guardian. Archived from the original on August 8, 2017. Retrieved January 11, 2015. The rapprochement of which Christie spoke has been referred to as 'The Cuban Thaw'. ^ "Se inicia la Cumbre con la mira puesta en el 'deshielo' cubano-estadounidense". Télam (in Spanish). April 10, 2016. Retrieved April 17, 2016. ^ Reyes Uschinsky, Carla (January 28, 2016). "Dos mujeres diplomáticas dirigen las negociaciones en el deshielo cubano". Mundario (in Spanish). Retrieved April 17, 2015. ^ "Obama begins historic visit to Cuba". Washington Post. March 20, 2016. ^ Nadeau, Barbie Latza (December 17, 2014). "The Pope's Diplomatic Miracle: Ending the U.S.–Cuba Cold War". The Daily Beast. Retrieved December 18, 2014. ^ Tannebaum, Daniel & Stokes, Amber (December 18, 2014). "Key Points from the President's Announcement on Cuba Sanctions" (PDF). First Take. PwC Financial Services Regulatory Practice. ^ Keane, Angela Greiling & Dorning, Mike (December 17, 2014). "Cuba's Half Century of Isolation to End". Bloomberg News. Archived from the original on December 18, 2014. Retrieved December 21, 2014. ^ Baker, Peter (December 18, 2014). "Obama Announces U.S. and Cuba Will Resume Relations". The New York Times. Retrieved December 18, 2014. ^ a b Archibold, Randall C.; Davis, Julie Hirschfeld (April 14, 2015). "Cuba to Be Removed From U.S. List of Nations That Sponsor Terrorism". New York Times. ^ "US and Cuba restore ties by opening embassies". Al Jazeera. July 20, 2015. Retrieved July 20, 2015. ^ CNN, Dan Merica and Jim Acosta. "Trump chips away at Obama's legacy on Cuba". CNN. Retrieved 2017-06-16. ^ "Live stream: Trump announces policy changes on Cuba". USA TODAY. Retrieved 2017-06-16. ^ Butler, Desmond (February 13, 2012). "USAID contractor work in Cuba detailed". Associated Press. Retrieved August 5, 2015. ^ Robinson, Circles (May 11, 2012). "US Says NO to Alan Gross-Cuban 5 Swap". Havana Times. ^ "Cuba libera a Alan Gross y EE UU a los 3 espías". CubaNet (in Spanish). December 17, 2014. ^ Mazzetti, Mark; Schmidt, Michael S. & Robles, Frances (December 18, 2014). "Crucial Spy in Cuba Paid a Heavy Cold War Price". The New York Times. p. A1. Retrieved December 19, 2014. He was, in many ways, a perfect spy—a man so important to Cuba's intelligence apparatus that the information he gave to the Central Intelligence Agency paid dividends long after Cuban authorities arrested him and threw him in prison for nearly two decades. ^ Goldman, Adam (December 18, 2014). "U.S. Spy Freed by Cuba Was Longtime Asset". The Washington Post. ^ Garvin, Glenn; Tamayo, Juan O. & Mazzei, Patricia (January 1, 2015). "Spy Wars: A Wilderness of Mirrors in U.S.–Cuba Swap". The Miami Herald. Retrieved January 2, 2015. ^ Ford, Dana & Lopez, Juan Carlos (January 12, 2015). "Cuba Releases 53 Political Prisoners". CNN. Retrieved January 15, 2015. ^ Adams, David (January 19, 2015). "Obama Must Work with Congress to Reform Cuba Embargo: Policy Experts". Reuters. ^ Avila, Jim & Keneally, Meghan (January 20, 2015). "President Asks Congress to Lift the Embargo Against Cuba". ABC News. Retrieved January 20, 2015. ^ Maselli, Giovanna (January 13, 2016). "Obama: 'Lift The Embargo On Cuba'". CBS Miami (WFOR-TV). Retrieved March 24, 2016. ^ France, Lisa Respers (February 16, 2015). "Conan O'Brien Takes Show to Cuba". CNN. Retrieved February 17, 2015. ^ After Thaw, Minnesota Orchestra Returns To Cuba by Euan Kerr, NPR on May 17, 2015. ^ "MLB Considering Games in Cuba". ESPN. Associated Press. February 28, 2015. Retrieved March 1, 2015. ^ Costa, Brian (March 19, 2015). "MLB Likely to Play Exhibition Game in Cuba". The Wall Street Journal. Retrieved March 19, 2015. ^ "Rays beat Cuban team with Barack Obama, Raul Castro in attendance". ESPN.com. March 22, 2016. Retrieved March 24, 2016. ^ "Direct Flights Between Cuba and New York Have Started". Skift. Associated Press. March 18, 2015. Retrieved March 19, 2015. ^ Hemlock, Doreen; Satchell, Arlene (May 5, 2015). "At least four Florida companies approved for ferry service to Cuba". Sun-Sentinel. Retrieved May 1, 2016. ^ Herrera, Chabeli (March 21, 2016). "Carnival gets approval to start cruising from Miami to Cuba in May". Miami Herald. Retrieved March 24, 2016. ^ Satchell, Arlene (April 22, 2016). "Historic Cuba cruise can sail with Cuban-born passengers, Carnival says". Sun-Sentinel. Retrieved May 1, 2016. ^ "Dramatic Increase In U.S. To Cuba Travel, Up 36 Percent From Last Year". NBC News. Associated Press. May 26, 2015. ^ "Cuban immigration to U.S. surges as relations warm". Pew Research Center. Retrieved October 7, 2015. ^ "Why the United States and Cuba are cosying up". The Economist. 29 May 2015. Retrieved 14 November 2015. ^ Usborne, David (4 December 2015). "Venezuela's ruling socialists face defeat at polls". The Independent. Retrieved 30 December 2015. ^ a b Klapper, Bradley & Weissenstein, Michael (January 21, 2015). "US, Cuba Spar Over Migration Policy at Historic Havana Talks". Yahoo! News. Associated Press. ^ Cuban immigration surges after thaw in US-Cuba relations by David Adams and Zachary Fagenson, Reuters on May 13, 2015. ^ a b Trotta, Daniel & Wroughton, Lesley (January 22, 2015). "U.S. Presses Cuba on Human Rights in Talks on Restoring Ties". Reuters. ^ Vick, Karl (February 27, 2015). "Cuba Talks Turn Awkward Over Terror Listing". Time. Retrieved March 1, 2015. ^ Archibold, Randal (March 17, 2015). "U.S.–Cuba Talks on Restoring Diplomatic Ties End Abruptly". The New York Times. Retrieved March 19, 2015. ^ "Raul Castro Says Cuba Blockade not Obama's Fault". The Huffington Post. Associated Press. April 11, 2015. Retrieved April 11, 2015. ^ Bobic, Igor (April 11, 2015). "Barack Obama and Cuba President Raul Castro Make History with First Sit-Down Meeting". The Huffington Post. Retrieved April 11, 2015. ^ Trotta, Daniel (January 21, 2015). "Cuba Wants off U.S. Terrorism List Before Restoring Normal Ties". Reuters. ^ Sparrow, Thomas (January 23, 2015). "How Will Cuba Get off the State-Sponsored Terrorism List?". BBC Mundo. BBC. ^ DeYoung, Karen (April 14, 2015). "Obama Removes Cuba from the List of State Sponsors of Terrorism". Washington Post. ^ Wall, Katie (May 29, 2015). "U.S. Officially Removes Cuba From State Sponsors of Terrorism List". NBC News. Retrieved May 29, 2015. ^ "US removes Cuba from list of state sponsors of terror". BBC.com. BBC News. May 29, 2015. Retrieved May 29, 2015. ^ Cuban Government Opens US Bank Account, Strengthening Diplomatic Thaw by Owen Davis, International Business Times on May 20, 2015. ^ "U.S., Cuba restore full diplomatic ties after 5 decades". CBC News. July 20, 2015. Retrieved July 20, 2015. ^ Welsh, Teresa (July 20, 2015). "After Half a Century, the Cuban Flag Flies Officially in Washington". U.S. News and World Report. Retrieved July 20, 2015. ^ "As Embassies Open, a Further Cuban Thaw Faces Hurdles in Congress". The Wall Street Journal. July 20, 2015. Retrieved July 20, 2015. ^ Al Jazeera Staff (January 28, 2015). "Raúl Castro to US: Return Gitmo, End Embargo". Al Jazeera. ^ Toppa, Sabrina (January 29, 2015). "The U.S. Will Not Return Guantanamo Bay to Cuba, the White House Says". Time. Agence France-Presse. ^ Vyas, Kejal. "U.S. Sets a Goal in Cuba: Open Internet". Wall Street Journal. ISSN 0099-9660. Retrieved November 30, 2015. ^ "Sprint to begin roaming service in Cuba". miamiherald. Retrieved December 1, 2015. ^ "A year on, Cuba urges Obama to make thaw 'irreversible'". Retrieved 2016-09-29. ^ "Abbott's trip to Cuba shows it's time for U.S. to lift trade..." www.mystatesman.com. Retrieved December 1, 2015. ^ "Starwood signs first U.S.-Cuba hotel deal since 1959 revolution". Reuters. 2016-03-20. Retrieved 2016-09-29. ^ "Cuban hotel becomes first to operate under U.S. brand". Reuters. 2016-06-28. Retrieved 2016-09-29. ^ "N349NB ✈ 01-Dec-2016 ✈ KATL – HAV / MUHA ✈ FlightAware". FlightAware. Retrieved 2 December 2016. ^ Jerry Markon (December 11, 2015). "U.S., Cuba to re-establish direct mail service in latest sign of normalizing relations". Washington Post. Retrieved March 21, 2016. ^ "US-Cuba aviation deal allows 110 scheduled flights a day". WTOP. December 17, 2015. Retrieved March 21, 2016. ^ "US restores regular flights to Cuba". Yahoo News. February 16, 2016. Retrieved March 21, 2016. ^ "Cuban Who Wrote Obama Says She's Thrilled to Get Response". New York Times. Associated Press. March 17, 2016. Retrieved March 20, 2016. ^ Annalyn Kurtz (July 7, 2016). "Eight U.S. Airlines Win Tentative Approval to Fly to Havana". New York Times. Retrieved July 7, 2016. ^ Robles, Frances (2016-08-31). "Scheduled Flights to Cuba From U.S. Begin Again, Now With Jet Engines". The New York Times. ISSN 0362-4331. Retrieved 2016-09-29. ^ "Historic commercial flight from U.S. lands in Cuba". Chicago Tribune. ^ "American Airlines flight lands in Cienfuegos, Cuba". Miami Herald. Retrieved 2017-06-23. ^ "Southwest Soars with 1st Miami-Fort Lauderdale Area to Cuba Flight". Tampa, FL Patch. 2016-11-13. Retrieved 2017-06-23. ^ "American Airlines soars into the Cuban market but most flights are half empty". Miami Herald. Retrieved 2017-06-23. ^ "JetBlue Lands In Camagüey, Cuba, Building on Its Historic First Flight With Even More Service From South Florida". www.businesswire.com. Retrieved 2017-06-23. ^ "It's another milestone with flight from Miami to Havana". Miami Herald. Retrieved 2017-06-23. ^ "JetBlue's First NYC-to-Cuba Flight Departs". NBC New York. Retrieved 2017-06-23. ^ "First Commercial US-Havana Flight Lands as Country Mourns". AP. November 28, 2016 – via The New York Times. ^ "Barack Obama tours Old Havana in Cuba at start of historic 3-day visit". March 20, 2016. Retrieved March 21, 2016. ^ a b Dan Roberts. "Barack Obama lands in Cuba as first US president to visit in 88 years". the Guardian. Retrieved March 21, 2016. ^ "Obama planning historic trip to Cuba to cement warmer ties". U.S. News & World Report. February 17, 2016. Retrieved March 21, 2016. ^ a b Victoria Burnett, Carnival Sails to Cuba, New York Times (April 22, 2016). ^ a b c Victoria Burnett, Cruise Ship From Miami Docks in Havana, Ending Decades-Old Freeze, New York Times (May 2, 2016). ^ First US cruise ship in decades arrives in Cuba, BBC News (May 2, 2016). ^ Frank, Marc (July 26, 2013). "Cuba's Raul Castro Promises Succession Has Started". Reuters. Retrieved January 15, 2015. ^ Oppmann, Patrick (26 February 2013). "Cuban President Raul Castro says he'll leave in 2018". CNN. Retrieved 30 March 2016. ^ Trotta, Daniel (January 26, 2015). "Fidel Castro Issues Statement Apparently In Support Of U.S.–Cuba Diplomacy". The Huffington Post. Reuters. Retrieved January 26, 2015. ^ Oppmann, Patrick (January 30, 2015). "Cuba to Build First New Catholic Church Since Castro". CNN. ^ "Cuba Will Continue to Defend the Ideas for Which Our People Have Assumed the Greatest Sacrifices and Risks". Granma. Retrieved April 17, 2015. ^ "In Paul–Rubio Feud over Cuba, a Preview of GOP's 2016 Foreign Policy Debate". The Washington Post. December 20, 2014. Retrieved January 15, 2015. ^ King, Ledyard (January 7, 2015). "Rubio Open to Hearings on Changing U.S.–Cuba Relations". USA Today. Retrieved January 15, 2015. ^ Menendez, Robert (December 17, 2014). "Sen. Menendez: One-Sided Deal Rewards Cuba Regime". USA Today. Retrieved January 15, 2015. ^ "Rep. Sires Pushes Back Against Obama's Cuba Plans". NPR. December 18, 2014. Retrieved March 22, 2016. ^ Hensch, Mark (July 9, 2015). "DNC chairwoman criticizes Cuba thaw". The Hill. Retrieved March 22, 2016. ^ "US–Cuba Shift: Opponents Threaten to Block Changes". BBC News. December 18, 2014. Retrieved January 15, 2015. ^ Kane, Paul & O'Keefe, Ed (December 19, 2014). "Opponents Formulate a Strategy to Derail Obama's New Cuba Policy". The Washington Post. Retrieved January 15, 2015. ^ Nelson, Rebecca (December 17, 2014). "Ted Cruz: Obama's New Cuba Policy 'Will Be Remembered as a Tragic Mistake'". National Journal. ^ Weigel, David (December 19, 2014). "Rand Paul Battles Marco Rubio Over Cuba Policy". Bloomberg Politics. ^ "Hillary Clinton Backs Shift in US Policy Toward Cuba". Firstpost. Indo-Asian News Service/Agencia EFE. December 18, 2014. Retrieved January 15, 2015. ^ Rappeport, Alan (December 17, 2014). "On Cuba, Hillary Clinton Is an Advocate for Normal Relations". First Draft. The New York Times. ^ "Poland Urges US to Go Further with Cuban Thaw". Radio Poland. December 19, 2014. ^ "Russian Foreign Minister Praises New US-Cuba Relations". Russia Insider. December 25, 2015. ^ "China Welcomes Move to Restore U.S.-Cuba Diplomatic Relations". China-US Focus. December 17, 2014. ^ Ahnsaf, Zalman (December 26, 2014). "Foreign Ministry Miffed Over U.S–Cuban Thaw". Hamodia. Jerusalem. p. 6. ^ Otis, John (December 18, 2014). "In Latin America, Not Everyone Is Thrilled with the U.S.–Cuba Thaw". All Things Considered. NPR. Retrieved January 15, 2015. ^ "Reacciones en el mundo por normalización de relaciones entre Cuba y EEUU" (in Spanish). Instituto Cubano por la LIbertad de Expresión y de Prensa. Retrieved April 20, 2015. ^ Goldberg, Jeffrey (December 21, 2014). "Canada's Foreign Minister: U.S. Influence Will Make Cuba Better". The Atlantic. Retrieved January 22, 2015. ^ van Hall, Karey & Heavey, Susan (December 22, 2014). "U.S. Sees Cuban Thaw Boosting Odds of Returned Fugitives". Reuters. ^ "Cuban Thaw May Unlock New Oil Fields". The New Zealand Herald. Aukland. December 22, 2014. Archived from the original on January 3, 2015. ^ Levinson, Mason & Novy-Williams, Eben (December 18, 2014). "Cuban Thaw Seen Creating 'Open Season' on Signings for MLB Teams". Bloomberg Business. ^ Allen, Michael; Vyas, Kejal. "Real-Estate Revolution Hits Cuba". Wall Street Journal. ISSN 0099-9660. Retrieved November 30, 2015. ^ Vyas, Kejal. "Cubans Say 'Nyet' to Russian, Hoping to Learn English". Wall Street Journal. ISSN 0099-9660. Retrieved November 30, 2015. ^ The New Republic, The Cuban Thaw Is Obama's Finest Foreign Policy Achievement to Date, by Joel Gillin, April 13, 2015. ^ "Broad Recognition that Cuba Should Never Have Been Listed as a State Sponsor of Terrorism". Granma. Retrieved April 17, 2015. ^ "Statement by the Ministry of Foreign Relations General Director for the United States, Josefina Vidal Ferreiro". Granma. Retrieved April 17, 2015. ^ "Most Support Stronger U.S. Ties With Cuba". Pew Research Center for the People and the Press. January 16, 2015. Retrieved March 21, 2016. ^ Office of the Press Secretary (June 16, 2017). "Presidential Memorandum on Strengthening the Policy of the United States Toward Cuba". whitehouse.gov. Washington, D.C.: White House. Retrieved June 17, 2017. ^ "Memorandum on Strengthening the Policy of the United States Toward Cuba" (PDF). Federal Register. Washington, D.C.: National Archives and Records Administration. June 16, 2017. Archived from the original on October 20, 2017. Retrieved October 20, 2017. ^ a b Fisher, Adam (June 17, 2017). "Trump 'canceling' Obama's Cuba policy but leaves much in place". ABC News. New York City: ABC. Retrieved June 17, 2017. ^ Merica, Dan (June 17, 2017). "Trump unveils new restrictions on travel, business with Cuba". CNN. Atlanta: Turner Broadcasting System. Retrieved June 17, 2017. ^ a b Holland, Steve (June 16, 2017). "Trump rolls back parts of what he calls 'terrible' Obama Cuba policy". Reuters. Canary Wharf, London: Thomson Reuters. Retrieved June 17, 2017. Wikimedia Commons has media related to United States–Cuban Thaw.